Seriously, why look at MY quote of all people? Microsoft said that they were shutting down the multiplayer in February, then it got moved to June. I can still play multiplayer like normal and find servers etc. Any news on what's happening? I am rather confused. 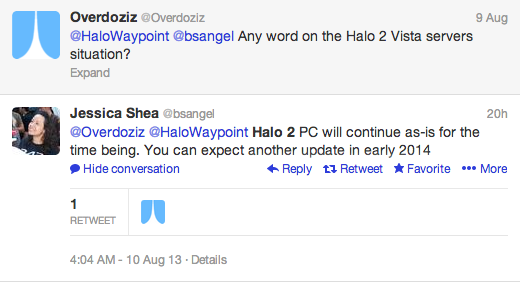 last I heard, 343i is planning some sort of update for h2. An update? This could be interesting. I guess we'll have to wait and see what happens. I can't play on any server for more than 3 minutes, LOL. chat text doesn't work for me anymore, i don't know if this is happening to everyone or just me. I demand that we get a better HEK for H2V. I think it means "We'll give you an update on the situation in 2014". As in "We'll let you know when we shut it down in 2014"
I've been trying to get in contact with them (MS/343i) about the real H2EK. So far I've been ignored or told that they cannot talk about it due to signing NDAs. Contacted Don Mattrick (before the last E3), no response of course. So lately I've been trying new avenues like Tweeting BS Angel about it, but she has also yet to respond. With MS closing down the G4WL Marketplace and hiring some former Steam head they are definitely going to make another move on PC Gaming, one to coincide with Windows 8.1. The question is will they support PC Gaming, or continue attacking it as they have since H2V/GoW PC failed to meet expectations. Through the portal a familiar shape awaits. Though GFWL is supposedly shutting down soon so would it migrate or just shut off? Time: Sun April 21, 2019 9:18 AM 203 ms.